Hi. My name is Charity Krahn. I am friends with, Tim and Bethani Webb, who are the loving parents of 4 beautiful quadruplets. They have had many fun and not so fun adventures so far as a new family, just like any other new family does, but with 4 times the cost usually. They have received many donations and kind words, but still need a little extra here and there. This will be a single income home from now on and will need all the help they can get. Any and all help is greatly appreciated for this wonderful family. These funds will be spent on food, clothes, diapers, for the girls. The girls playing with Daddy and some bubbles. The girls are growing like crazy. They are now reaching the point people can tell them apart. They each have individual personalities and are so fun to be with. 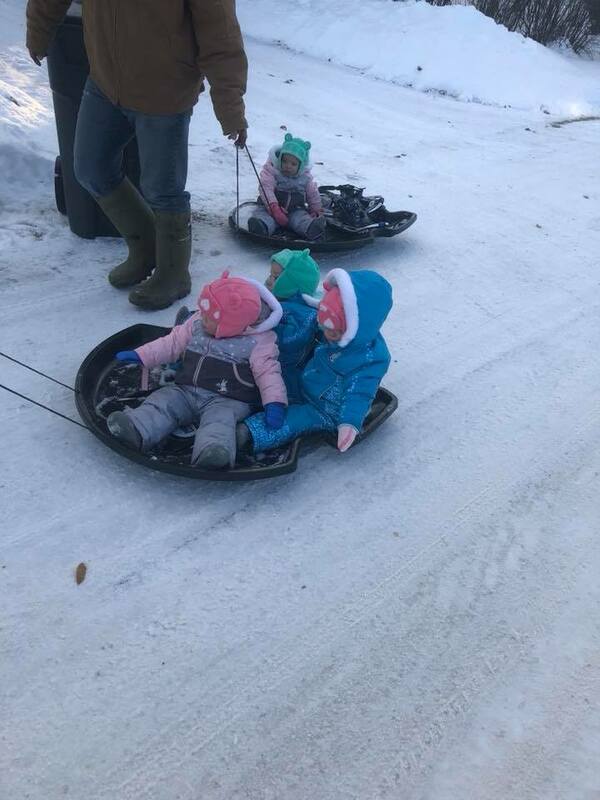 The girls out on a sled ride. Its been a little over a year since these beautiful bundles joined our world. They are growing so big and doing so well. Mom and Dad were able to get their own home so Grandma can have her own space. Fortunately its only a few blocks away. So much good has been happening for this family. Thank-you to everyone who donates. Your gifts help them to have the things they need. Good luck with the babies... I read the CTV article and thought I would pass along that when my triplets were born, I sent lots of companies letters ( with a copy of a letter from my obstetrician) asking if they had discounts or specials for multiples... I received 3 free car seats from fisher price and lots of freebies from other companies. Plus 1year of free formula from Mead Johnson. Everyone was so great... I hope this helps. I'm just wondering if anyone knows if the family will be taking donations in the form or gently used items? I have a ton of girls clothes and baby accerssories that were only used once and would gladly donate them if that is something they are accepting? Congrats to the parents and best wishes. Hi I make baby hats and quilt I would love to make each little blessing a blanket and a few hats, can you please give address to send gifts, good luck. Hi Nicole I just asked Bethani and she said that they were accepting gently used items. Id love to make the girls something special, I love to crochet, and was thinking hats and boot sets if they would be ok with that. Hello - My name is Kirstie. 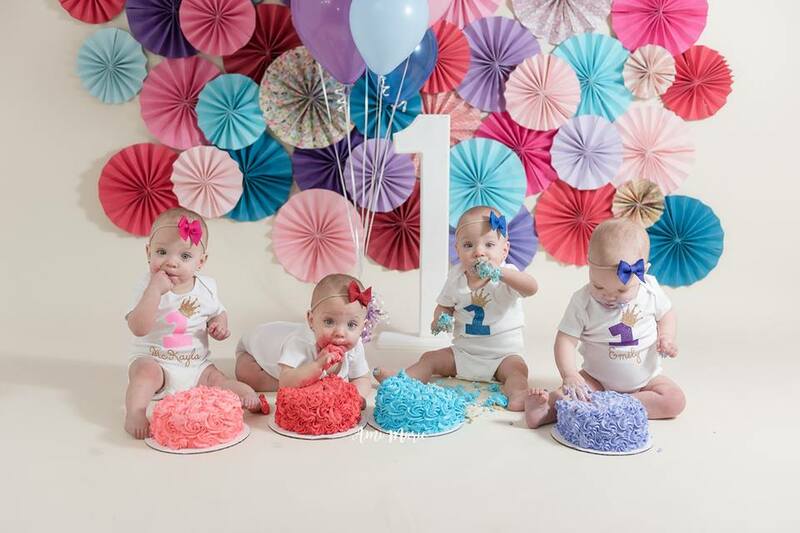 I am contacting you from Caters News, we are an international video licensing agency who work alongside the worlds most influential media organisations such as Daily Mail, Unilad, Ladbible etc we are extremely eager to talk to you about licensing and running a story on a video of the quadruplets hugging please can you ask the parents to get in touch asap. I see this story on Facebook they should link your go fund me to it. It says you received 50k but I can see that's not the case. Good luck with the quads . I know there more people that would want to help if given the opportunity to. I would love to follow you. Do you have a Facebook site? Gods miracles. Praying for a safe delivery. Why are people congratulating excess? "Four times the love..." Yes I know the stock answer. Blessings to all of you and have a great Christmas! Your daughters are beautiful. What an exciting time. Enjoy every moment. They'll all be grown before you know it. Those little girls look like angels, but it may not seem that way when they are all crying. Blessings and best wishes to you all.